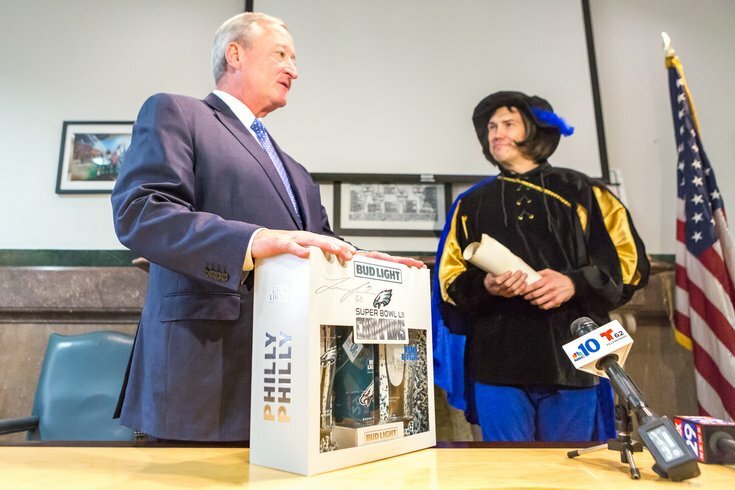 Philadelphia Mayor Jim Kenney and "The Town Crier," pose with a Bud Light Super Bowl LII "Philly Philly" Commemorative pack. Buzz about the limited-edition Bud Light “Philly Philly” commemorative packs broke out like the town crier announcing the royal birth. Everyone had their ear to the ground – and their credit cards ready. And boy, did they sell out quick. While beer distributors across the city enjoyed a huge day of sales last Thursday, they shared the same frustrations over inadequate supply for massive demand. Bud Light produced 20,418 commemorative packs, which corresponded with the date of the Eagles’ Super Bowl win over the New England Patriots on 02/04/2018. Mary McMullen, assistant manager at Bella Vista Beer Distributors, said that a line of dozens of people began to snake around the outside of the store around 2 p.m., when news broke that the packs would be going on sale right at 4 p.m. While Bud Light wouldn’t disclose which locations would sell the packs, consumers were lining up at stores all around town on just a hunch, a hope and a prayer. While they only had 18 to sell, McMullen said that the Bud Light packs at Bella Vista were sold out within minutes. “The line started forming at 2 p.m. They were gone by 4:05 [p.m.],” she told Philly Voice. McMullen said that folks at the end of the line were so desperate to get their hands on the collector’s item that they were waiting to see if anyone in front of them had been turned away from a credit card denial. Franklin Beverage, a mom and pop beer distributor at 18th and Callowhill streets, has been in business for 11 years. Owner Joe Carroll said that they were only allocated eight Bud Light commemorative packs, and (not surprisingly) they were gone that afternoon. “The phone didn’t stop ringing,” Carroll said. “People started Facebooking and texting us early about it, so we had three or four that were pre-sold…We tried to hold them for some of our loyal customers. But people were starving for them. A Bud Light spokesperson said that the company knew the packs were going to be popular, but that they were surprised by the "overwhelming" response from Eagles fans. “We had some retailers telling us that they had lines outside their stores with people waiting to purchase the pack. As a result of the strong demand, we sold out of the pack within a few days of it becoming available,” the spokesperson wrote in an e-mail.